I enjoy watching the news and weather and some selected programs. I also like the company that the TV provides even if I am not watching it. On my Christmas wish list was this 12Volt TV, articulating wall bracket and amplified digital antenna. Thanks to my lovely wife Denise, son Brent 2, his wife Manina, & their daughter Avery it came off the wish list to a Christmas present. With a little planning I picked this location at the back of the camper where I can see it from the front area too. As noted it runs on 12Volts but also has the 110 Volt power supply too. The amplified antenna is paper thin and can be hung in the rear or ether side window (digital signals are so directional) and runs on a USB connection. 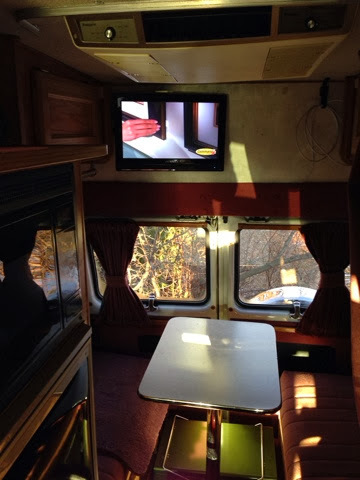 The TV uses 20 watts or the same as a 12 Volt vehicle dome light. This becomes important on how I power everything to be discussed in a future post. I have an application for my IOS devices that shows me the location of all TV transmitters and what network the are. This way I can figure what direction (window) to put the antenna. I just need to scan for channels every time I move around. It is also a DVD player and PC monitor. With the WIFI hotspot on my phone the family subscription to Netflix & since we have HBO at home I can get HBO on the go on the road. So, I should be good now for entertainment. If/when I stay at a campground that has cable I need to fit the camper with a connection to get this feed.